Very interesting article in Boston Magazine about the chef/owner of O Ya - the highly touted sushi restaurant in the South Station area. I know several sushi chefs in the Boston area and they basically corroborated the story. They actually mentioned this a couple of times to me before this article ever came out. Here's the short version, owner Tim Cushman ate at area restaurants and stole their recipes under false pretenses before opening O Ya. Now here's the longer version. "He's been deceiving people for years," says Ken Oringer, who refuses even to step foot in the place. 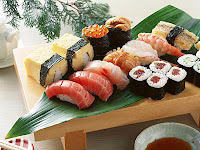 According to Oringer, Cushman spent the two years before opening O Ya scoping out his sashimi bar, Uni. "Twice a week he would call and ask to have menus faxed to him. We thought, ‘Hmm...this guy's a little weird.' I mean religiously, every Friday, he came in." Cushman, it turns out, was pulling the same routine at Oishii in Chestnut Hill, where he was also a regular. After watching this stranger take notes at his sushi bar, chef-owner Ting Yen confronted him. "[Cushman] said he was doing a job, basically in New York, to come up with a menu and ideas for people who were opening restaurants," says Yen. All I can say is that is pretty messed up. I haven't eaten at O Ya yet, and now out of respect for the sushi chefs that I know in the area, I don't think I ever will. Click (here) to read the whole article. 3 Response to "O Ya Chef Garners Some Controversy"
It sounds like Cushman was being a responsible businessman and doing marketplace research prior to opening. It is what every other store/company/firm does and it makes a lot of sense for restaurants to do it. He didn't steal any recipes. The one example they had was pairing foie gras with sweet wine and fruit...yeah -- that's original. That has only been going on for a few hundred years. Your welcome not to go to the restaurant if you are displeased with him, but I don't see why you would punish someone for being responsible and good at his job. This is true. I eat at Uni regularly, and I got to seeing Cushman and his wife frequently. They seemed like another pair of regulars there, just huge fans of Ken and Chris's work. But then when I heard they abruptly quit coming and opened their own place, it really left a bad taste in my mouth. I eventually did try out O Ya, and the quality really wasn't there. Flavors were combined with seemingly little thought, hot dishes were served lukewarm, knife work was sloppy, the room is cold and uncomfortable, service was random. I spoke to both that night, and they talked about their cuisine like no one had done such things before. It was really odd. I'm still going to Uni. Sounds like sour grapes to me. We love O Ya and if they're wildly successful where others have only been moderately successful, it's not because of theft. It's because they obviously did their homework and improved dramatically on what they found.